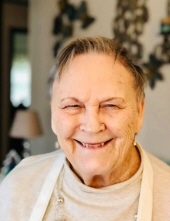 Patricia Anne Mollet passed away after a sudden illness on Saturday, March 30, 2019 in Oklahoma City at the age of 84. A graveside ceremony will be held on Thursday, April 4, 2019 at 2 pm at Resthaven Memorial Park. The family will be at Trout Funeral Home Wednesday evening, April 3rd, from 5-7 pm to receive visitors. Patricia was born to George and Gladys Gregg on October 5, 1934 in Ponca City, Oklahoma. She graduated from Ponca City High School in 1953 and married Adolph (Duff) Mollet on September 2, 1955. After high school, Patricia worked at the local ONG office for 10 years and left there to raise her three children. She later worked for Charlie Ryan's Taco Hut. Patricia enjoyed family time, spoiling her precious grandchildren, working in her yard, and cooking. She is survived by two of her children, Mike Mollet and wife Brenda of Ponca City and Lori Horn and husband Max of Ponca City, her daughter-in-law, Michelle Mollet of Ponca City and her sister, Carolyn Fee of Newkirk. She is also survived by her grandchildren, Lindsi and Kalley Horn of Ponca City, Amanda Oldham and Jay Johnson of Edmond, Hope Johnson of Ponca City and Robyn Johnson of Nowata. She was preceded in death by her husband in 2007, her son, Randy Mollet in 2017 and her mother, father, and brothers, Delbert Gregg and Jerald Gregg. To send flowers or a remembrance gift to the family of Patricia Mollet, please visit our Tribute Store. "Email Address" would like to share the life celebration of Patricia Mollet. Click on the "link" to go to share a favorite memory or leave a condolence message for the family.